Years ago, meals eaten around the table were the norm but, today, meals are often eaten on the run, and that's why so many people don't know how to set a table! Along with that often comes the clueless feeling of not knowing which utensils to use when sitting down to a formal meal. Luckily, we're here to show you how you can dress up your table without experiencing any stress. Center stage, as we know, is our dinner plate (that's the easiest part!). For our utensils, we work our way from the outside in, in the order in which we'll be eating our meal, so that makes it easy to figure out which utensil to use next. We place the salad and dinner forks to the left of our dinner plate, with the one being used first on the outside. To the right of the dinner plate goes our knife, blade in (toward the plate), of course, then the spoons on the outside, again, with the first one to be used placed on the outside. 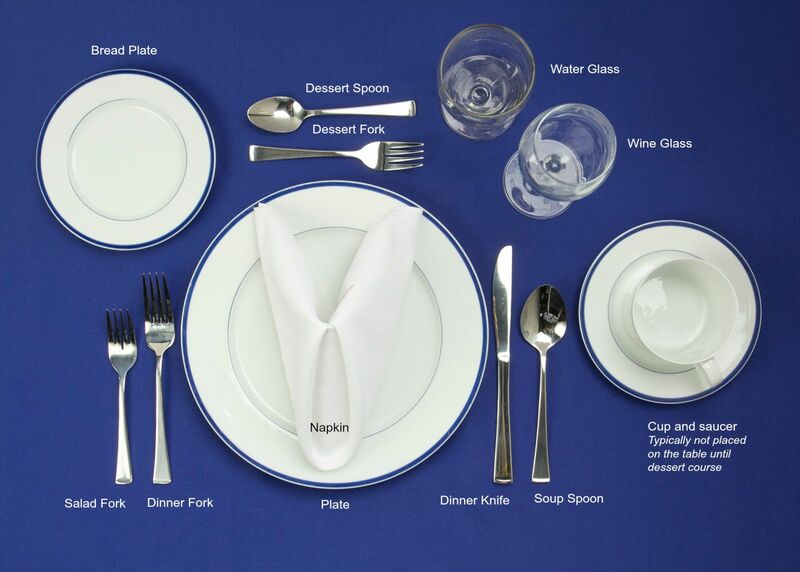 As for our napkin, it can be placed on the dinner plate with or without a napkin ring, or folded under our forks. If we are using a bread-and-butter plate, it should be placed to the left of the forks, and the water and/or wine glass should be placed above the knife and spoon. The kinds of plates and flatware you use can have a big effect on the overall look of your table setting. If you're going for something a little fancier, you may want to bring out your best tablecloth and plates. Remember, you can customize to meet your needs! If you're not serving a salad, then don't bother setting out the salad fork. If you're serving both red and white wine, then put out two wineglasses instead of one. 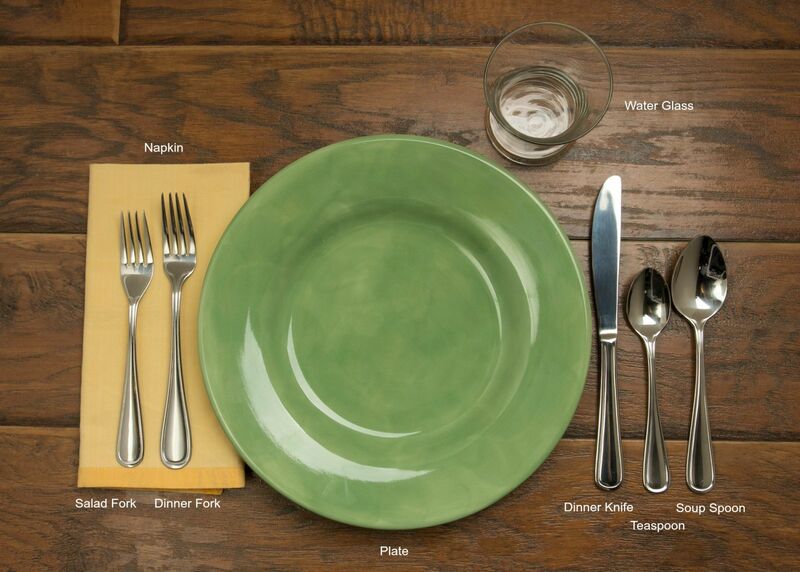 Most days of the week, you'll probably be setting your table up with a basic table setting. This arrangement is pretty simple and you probably already do it without even knowing! Place your dinner knife to the right of the plate with the blade facing the plate. Place your spoon next to the right of the knife. Place your napkin to the left of the plate with the dinner fork on top of it. Place your water glass above the dinner knife. Inviting friends or family for a meal? Then you'll probably want to consider an informal table setting. By adding a couple of other utensils, you've got a table that's set to impress your gang! You can choose to add a soup bowl or salad bowl on top of your dinner plate. Whether you've got company to impress or you like adding a touch of fancy to your holiday feast, a formal table setting is always sure to make them say, "Wow!" Place your dinner plate in the center of the table setting with the dinner knife directly to the right, blade facing the plate. Place your napkin on the dinner plate. You can choose to fold it using an elegant technique. Place your soup spoon next to your dinner knife. Place your dinner fork to the left of the dinner plate, with the salad fork to its left. Place your dessert fork above your dinner plate and your dessert spoon above your dessert fork. Place your bread plate to the upper left of the dinner plate. You can place a bread knife on it as well. Place your water glass to the upper right of the dinner plate with the wine glass slightly below and to the right. You can choose to place a cup and saucer, next to your dinner plate, but it is often brought out and placed during the dessert course. You can choose to add a soup bowl or salad plate on top of your dinner plate. Setting a table is really just common sense, and now, whether you're home, at someone else's house or a restaurant or fancy event, you'll know the basics and never be embarrassed. All that's left to do is enjoy the..."OOH IT'S SO GOOD!!" I love setting a beautiful table. It seems this has been lost and replaced with disposable everything. When you make a beautiful setting it is the making of family holiday memories. Thanks! You know there was a day when I needed to be sure of this and it was very helpful.